A picture is worth a thousand words, or so the old saying goes. One might be less inclined to think along those lines as a “traditional” blogger. After all, blogging’s popularity was built upon a foundation of the written word. But we are now entering a brave new era in which image-driven media is becoming more and more prevalent. And that’s not even to mention the simple fact that images can have a completely different (and unique) impact when compared to words. Whilst you can use words to convey thoughts and feelings that might not be possible with imagery, the same is equally possible with images. One simple photo really can have as much of an impact as a thousand words, and in our impatient society, that can be a powerful tool. With that in mind, in this post I have compiled a collection of the best free WordPress photography themes available. They all do a great job of presenting images you place on your site as focal points. So why not give your fingers a rest and let your camera do the talking for once? Enjoy! Is there Any WordPress Theme for Astrology Related Niche Sites? Hey Tom is there any chance you will do a followup on this your original posting was in 2012 I would like to see what’s in the market today. Nice collection of themes! Love This Post! Great Share Tom!! Loved the Theme gRID! ‘Portfolium’ is an amazing theme and am using this theme on a furniture website. Thanks for your great article. I love these themes a lot. Most of them ‘Digiphoto’ is the best for me. thanks Tom for sharing awesome photography themes !!! 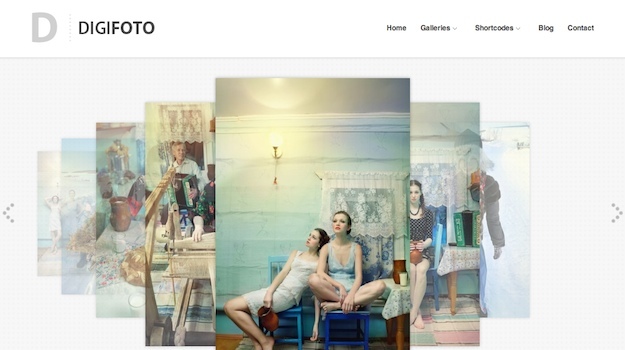 A great list of wordprss photography themes. Very nice sharing Tom. thanks for share. Themes so nice. Brand-new @ this. I don’t seem to be having any trouble getting Digiphoto for free, but don’t have the “slider” function. I have downloaded your carousel…but where do I “put” it? Thanks for these. It was great share. They’re trickily not free, do your research better. Nice write up Tom. I’d be really interested in your thoughts on Photocrati’s take over of NextGEN… I know it’s been a while since that happened but I noticed they seem to be making updates at a steady rate, and growing their business quickly. As it relates to this post on Photography themes, what do you think of the Photocrati themes on offer? Thanks for the mention in your comment. It would be great to see Photocrati on this list, but our theme is not free. Regarding NextGEN – we are working hard on NGG 2.0 and a premium version. There is a lot of amazing things to come!